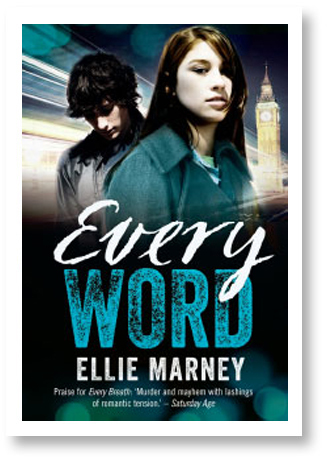 Ellie Marney is a qualified teacher and writer of Young Adult crime fiction. 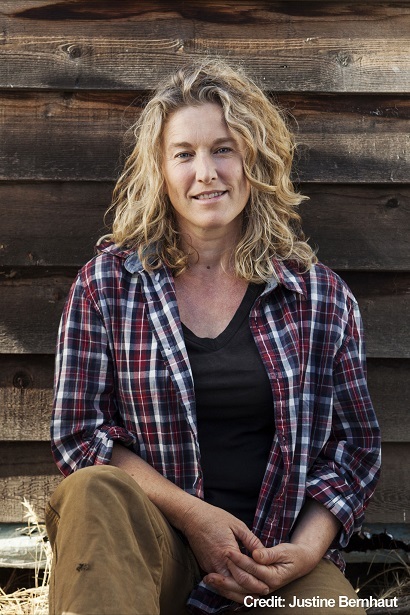 Her first book, Every Breath (Allen & Unwin, 2013), was shortlisted for the Ned Kelly Awards, the Sisters in Crime Davitt Awards, and the Centre for Youth Literature’s Gold Inky. The Every series (including two follow-ups, Every Word (2014) and Every Move (2015)) has now been published in eight countries. Ellie lives on ten acres in rural north-central Victoria with her partner (also a teacher) and their four sons. Oh, I started in the usual way! That is, I did a lot of writing as a kid, much of it fairly awful. I lost confidence in university, when I studied literature, then slowly started writing in journals. I began writing fanfiction in my late twenties, and discovered a way to put stuff out there, and receive feedback, that was wholly satisfying and encouraging, and when I really got my mojo back I began writing originals again. Then I began entering writing competitions, and in 2010, I won a major women’s short crime fiction award, the Scarlet Stiletto. That was sort of what kicked things off for me. I wrote Every Breath, my first YA crime novel, and signed with Allen & Unwin a few years later. Goodness, looking at that description makes it sound so easy… I should probably point out that more than twenty-five years and four children and teaching jobs and overseas work and things happened along the way. 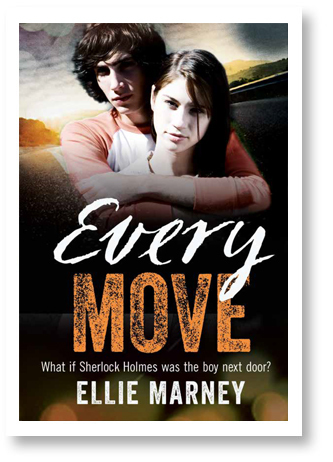 Every Move, the final book in the Every trilogy, was released in March – that was a really hard book to write, and getting it out there felt very satisfying (if a bit exhausting). I’ve had such a fantastic response to the Every series, from readers, teachers, librarians, other writers… It’s very gratifying, and I feel very lucky about that. At the moment I’m writing a new YA crime standalone, with a secondary character from the series – a spin-off, I guess. It’s set between Mildura and Ouyen, and features a tearaway country boy, a police sergeant’s daughter, and some very gritty scenes undercover with a rural drug ring. I’ve been a bit nervous, writing about drug crime, but I also think it’s something that teenagers have to deal with, which makes it important and worth talking about. I’m leavening the tension with some swoony romance, and I’m enjoying writing those bits too, I have to say! Fairly spartan. 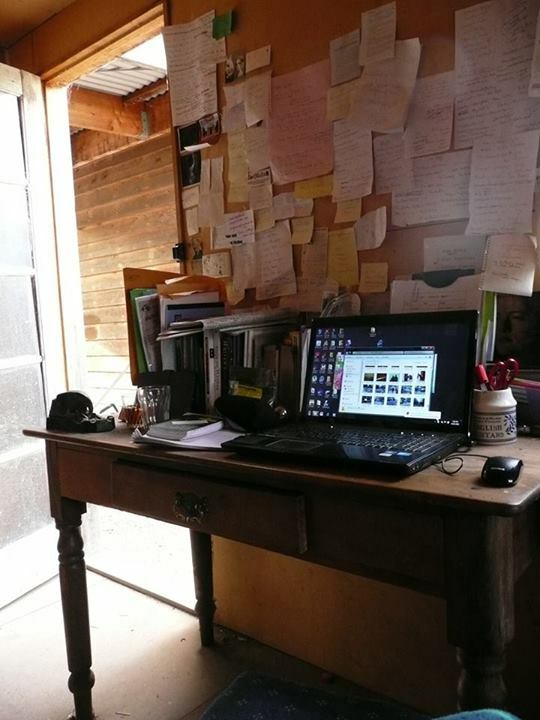 My work space is a tiny weatherboard shed, semi-detached from our tiny weatherboard house, and it’s not very glam – I get bugs falling on me from the light fixture above my desk in summer, and freeze my arse off in winter, cos there’s no heating. If you want a very disgusting story about it, I can tell you about last year, when we poisoned all the rats in the storage area behind the shed. One of them died in the roof cavity, so there were maggots falling from the unplastered ceiling into my hair while I was sitting at the keyboard… Yes, I told you it was disgusting! We live in a rural area, about two hours from Melbourne, so there’s not much in the way of internet, or anything else. Lots of bush and sheep and kangaroos, that’s about it. It’s a bit isolated, but that’s not necessarily a bad thing when you’re trying to work. I’ve started using a standing desk recently, cos I was getting so much back and leg pain – it’s been a major improvement. I used to get up horribly early, when all my kids were little, but I don’t do that so much anymore, although I still like working early in the day. Now, I usually get up at 6.30am, work until 7.30am, or until everybody starts hassling me, then I go in and make breakfast, get the kids off to school, then I’m back again by 9.30am to get into it. I try to work straight through until 3pm (school pick-up time), although I might take an hour off to have a nap. I often get sucked in, though, and find I’m still chasing words around at 2.45pm, and wishing for more time. The whole routine changes, of course, if I’m teaching (I still do relief teaching sometimes), or if I have a school or library visit. And I’m a horrible “picker” – I’ll leave the doc I’m working on open all day, and if I have a moment after dinner, or before bed, I’ll go out and sit in front of it and pick at it. If I’m still picking after midnight, I have to force myself to go to bed. Um…sort of just sitting – or standing, now – and staring off into space, and thinking a lot, and then typing…? Well, that’s what I do. The process usually starts with an idea, a “what if?” question, or maybe I’m just trying to work out a particular person, who turns into a character, who then starts speaking in their own voice in my head. I’m a pantser, rather than a plotter. I usually jot down snippets of conversations, or scenes, or ideas for where the characters are going, in a classroom exercise book, and then I slowly piece everything together, like a patchwork quilt. I do get kind of intrigued by characters, and situations, and wondering how this person came to be this way, or how that person made that particular choice… I think storytelling is just a way of examining the world, really. Letting you figure out things about life and people in a sort of microcosm of your own invention. I think the hardest part is convincing people – myself included, sometimes – that this is work. I still feel hugely privileged to be doing this, and I think most people’s concept of writing is often weirdly glamourised, and a bit “oh, what a great hobby”. I have conversations with people who say “well, while you were writing, I was at work today”, which I find frustrating, because while I know it’s a privileged job, it’s still very much work to me, and I hate having to justify myself. I write – I also teach in classrooms, support someone with a disability, talk at schools and libraries. Each of these things is work. I find the juggle – writing, parenting, householding, promoting, working other jobs – quite hard too, but I’m starting to get a handle on it. I’m still a crazy person at release time, and I rely on my partner a lot, but I’m not as shocked by the insanity as I once was. I wish I’d known that I wasn’t just starting an artistic career, I was starting a small business. I would’ve been a bit more prepared! 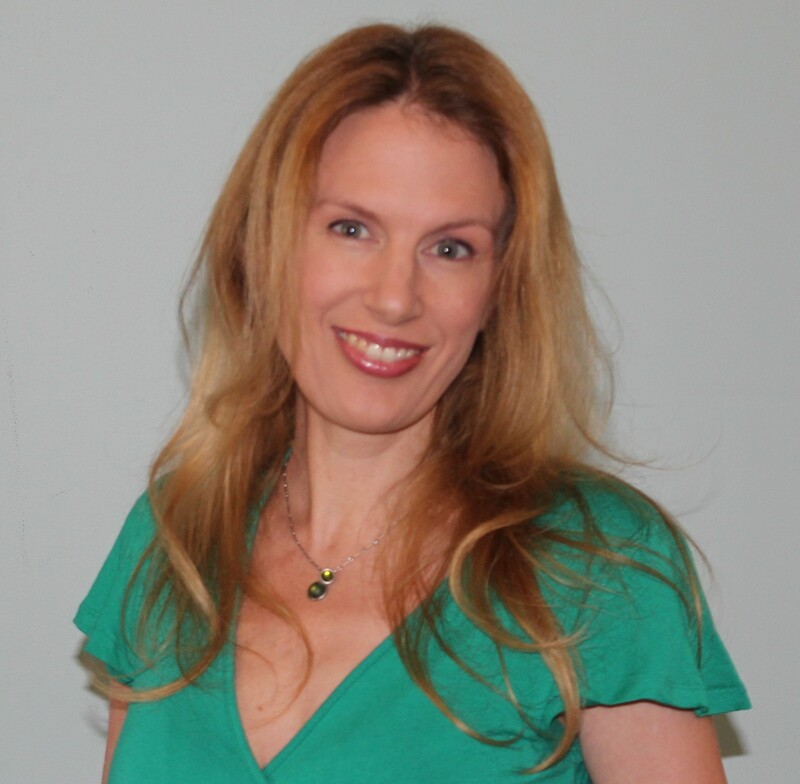 I would’ve hired an accountant sooner, and got myself organized a lot more. I also wish I’d known how welcoming and generous the YA writing community is before I started – it would’ve saved me half an ulcer’s worth of anxiety and nervousness. I’d like to see more parents reading the books their teenagers bring home. I’ve got a real bug about encouraging parents to stay aware of what their kids are reading – not so much to allow them to vet content, but so they have some insight into the worlds their kids inhabit. The literary landscape (and indeed, the world) has changed so much since most parents were in high school. And many parents don’t know anything about it, which I think is a shame, because if you dip even a little into children’s fiction, you can open up dialogue with your kids about it, create a bridge into their universe, and get to know what’s on their minds. And, for bonus points, you get a whole new range of amazing fiction to enjoy! So that’s my personal vision. Artistically, I’d like to write more authentic stories with diverse characters, especially working-class, non-Anglo and differently abled characters, because there’s just never enough representation of those characters in YA. I also want to keep my representation of women characters true. And I hope I keep improving, a little bit all the time. Margaret Atwood, Helen Garner, Melina Marchetta, Maureen Johnson, Honey Brown, Maggie Stiefvater – those are all authors I would walk over broken glass to get their next book. I admire writers like Joanna Russ, and Sheri S Tepper, and Agatha Christie for being so ground-breaking. There are heaps of female authors I love, but then this would turn into a very long list. Honey Brown, Nicole Hayes, Catherine Jinks, Amie Kaufman, Kirsty Eagar, Trinity Doyle. And thank you, Pip Harry and Melissa Keil, for recommending Ellie!